Would ‘Lose the Lawn’ Solve L.A.’s Water Problem? Published May 6, 2015 / by dcoffin / 1 Comment on Would ‘Lose the Lawn’ Solve L.A.’s Water Problem? Would "Lose the Lawn" solve the City of Los Angeles's water problem? Throughout the state the crescendo to eliminate residential lawns has grown louder among water boards, agencies and political leaders. 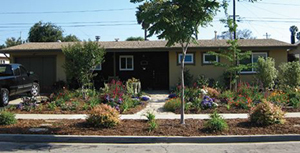 In Los Angeles, a partnership between the Metropolitan Water District and the DWP will even pay residents $3.75 per square foot to convert their lawns 'drought tolerant' landscape with arguable curb appeal. "Californians should water enough to save their trees, but should let their lawns go the way of all mortal things." So given the following extreme example, how much water could the city save if every single family home throughout the city participated in the program and killed off their lawns? And what would the long term benefit be to residents? According to the LADWP, the 627,395 single-family residential homes it serves used an average of 144.88 HFC (hundred cubic feet) of water during the 2013/2014 water year. The same year 764,402 multi-family residential homes used an average of 96.42 HFC. In our example we'll ignore other patterns of usage between the two types of homes (residents per household, etc.) and simply assume that the difference is entirely landscape and cut the single family home demand to 96.42 HFC just like multi-family households. By 'Losing the Lawn' we find the city would at most reduce water demand by 69,805 Af/y or 12%. The actual reduced demand would most likely be much lower. Outside of finding a way through this statewide drought there is no real long term benefit from turf removal for the residents of the City of Los Angeles. The main beneficiary of the reduced demand would be the Metropolitan Water District since the city would be buying less water from the agency each year. If the MWD could store this water and build up reserves that would be a good thing for all. However it will most likely will be a combination of storing some of the water and selling the rest to its other member agencies. 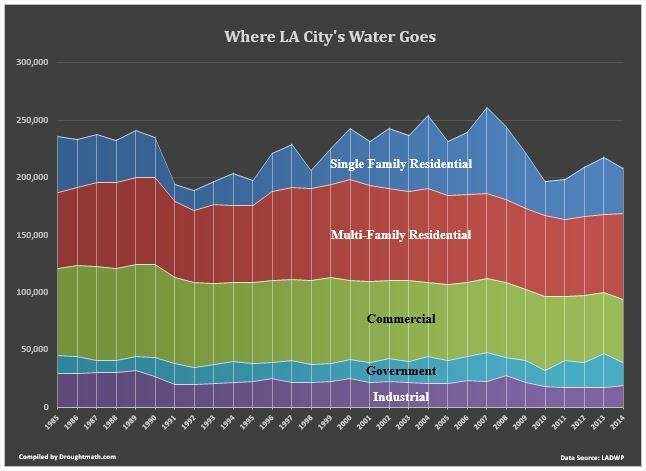 As for the city and it's residents, L.A.'s continued growth enabled by the departments heavy reliance on paper water would quickly wipe out all of the savings within ten years. The city's 2010 UWMP projects the demand will increase by 60,000 Af/y in 2025 and by 86,000 Af/y in 2030. Nearly all of this increase will be multi-family residential so effectively residents would be trading their homes lawn for density. Since we can expect that the city's real water supply will remain flat, growth will assure that the city's future supply would be as tedious after the lawns are gone as they are today.